Inventory We are a resale marketplace, not a box office or venue. Ticket prices may exceed face value. This site is not owned by Bankers Life Fieldhouse . Bankers Life Fieldhouse is a sports arena in Indianapolis, Indiana, United States. This arena is suitable for indoor concerts and sporting events including basketball and hockey. It is the home of the Indiana Pacers of the National Basketball Association and the Indiana Fever of the Women's National Basketball Association. The Indiana Ice of the United States Hockey League also use Bankers Life Fieldhouse as their home arena for a few games a each year. The name is a result of the naming rights to the venue being sold to Bankers Life , the financial services organization based in nearby Carmel, Indiana. In 2005, 2006, and 2007, Bankers Life Fieldhouse was ranked the No. 1 venue in the NBA according to the Sports Business Journal/Sports Business Daily Reader Survey. In 2006 The Ultimate Sports Road Trip reaffirmed Bankers Life Fieldhouse as the best venue in all 4 of the major sports leagues. "The Ultimate Sports Road Trip has recently concluded a re-scoring and re-evaluation of all 122 franchises in the four major sports, based on our personal visits to each of the teams in a journey that began in 1998. Based on our criteria, Bankers Life Fieldhouse has once again withstood scrutiny to be named the "best of the best" in the four major sports. 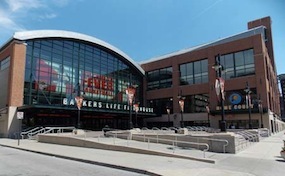 Everything about Bankers Life Fieldhouse is top notch, a sparkling venue in a sparkling city," said Farrell and Kulyk. FieldhouseIndianapolis.com is a privately held company that specializes in the sale of tickets in the secondary market. We are not affiliated with any official supplier or box office. To purchase tickets to any Bankers Life Fieldhouse in Indianapolis events simply call our operators at anytime or click on the event you wish to attend.